After having both boards used for more than 5 times each it is time to share my findings. The boards are real slalomboards, even I (as speedsurfer) can seriously feel the difference with gybing compared to speedboards or other boards used before. It actually took a long time to find the board its weak spots, I strong believe there isn't the perfect board for everything. But after testing on different locations/conditions I think to have enough experience for a usefull review. The first thing I noticed was the extreme upwind performance, but also high crosswind speed. Not needed to go upwind in strong gusts to keep in control. Also comming from the Fanatic Falcon monoconcave boards it was definitly different, I had to push a bit harder, after a few sessions I learned the trick. 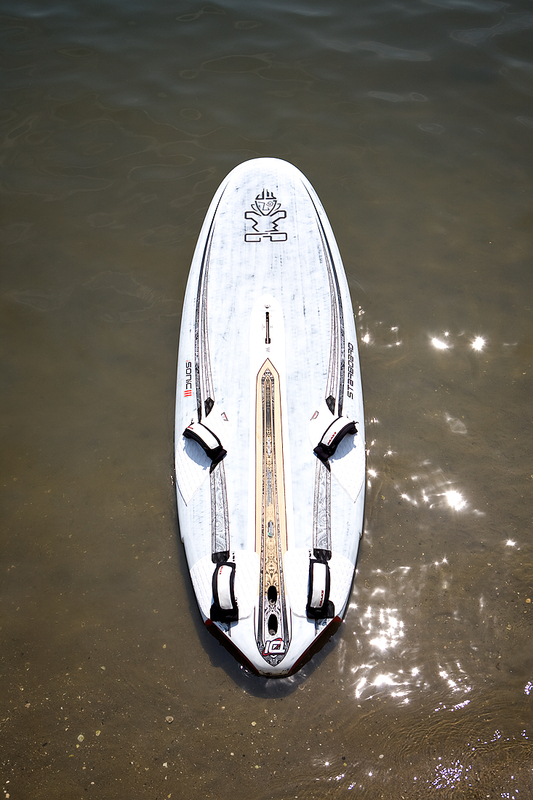 I was a bit affraid these slalomboards had limited speedpotential, especially on flat water. 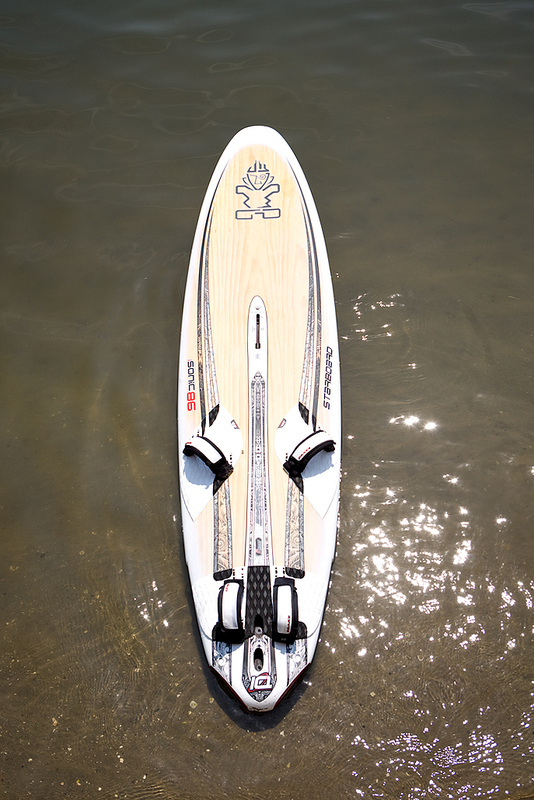 But it was totally different, the boards accelerate great on flat water. On choppy water better take a bigger iSonic to get enough lift to fly over it. From 111 to 86, is there a serious gap?? Is it possible to jump from 68.5cm wide to 56cm wide? I didn't think it was smart. I wanted to have fun below 15kn soo the iS111 was the compromise. Still there was a board needed that would do 65km/h average as fast as possible, this is exactly what the iSonic 86+ sonntag SL-S 32cm is all about. I am happy it works, actually surprised the iS111 did 66km/h peak with me driving it. It is fun trying to push a big board to high speed, it is definitly more fun for "not-perfect-high-wind-speed-days". I owned a 2006 iSonic 105, at that time I had some less sailingskills soo actually hard to compare. One thing I am really sure about, the new ones are still very easy to get going. Space for error, great boards to start, gybe etc. I use on both boards all the footstraps in the back and masttrack at recommended. For the iSonic 111 the Sonntag Fins SL-S 400 till 430 is favorite, the iSonic 86 I like to sail with the Sonntag Fins SL-S 320 till 330. One note my biggest sail is 7.0, soo for the iSonic 111 you might find a bigger fin better suited for bigger sails. For select fans I highly recommend the new S10 39cm for the iSonic 111 or the S07 31cm for the iSonic 86. I tested the powerfull select fins and this made me realise for best overall performance the iSonic slalomboards like powerfull fins, yet it is possible to use less powerfull fins (but you need some more fins to suit all conditions). These starboard iSonic boards have a unique and usefull combination of strenghts and weaknesses. As said before I am a strong believer of strenghts and weaknesses and this is what I am looking for. As long as you remember the weaknesses you can be the fastest man on the water. It simply is hard to beat the iSonic in the sweetspot ;). Serious speedpotential, no matter what waterstate. Superhigh crosswind speed, the first board that allowed me to keep up with speedchamp Peter de Wit at crosswind in medium wind. Bottom-end in choppy water. Example: iSonic 86 in 15-18kn in choppy water is quite hard to ride fast, while it does on flat water twice the windspeed!!! Solution: Better take a bit bigger iSonic to keep enough lift and power to fly over the chop. Passive planning, it is possible but the iSonics need more speed before solid planning than long stretched slalomboards. For me I need to pump at least 2 times more before getting in straps and harnasslines. Solution: Again take a bit bigger iSonic to keep enough lift and power to get flying, or learn how to get into planning active (only needed for flatwater). Please respond if you liked this review or maybe some missing information? ?